India’s Prime Minister, Narendra Modi, who came to power with great fanfare in May 2014, appears to have little to trumpet now, three months to the next parliamentary elections. With his achievements falling woefully short of the grandiose promises he made, Modi’s Bharatiya Janata Party (BJP) is facing the prospect of a hung parliament or even a defeat in the May 2019 elections – a far cry from the road roller majority it got a little less than five years ago. When the BJP-led National Democratic Alliance (NDA) swept the 2014 parliamentary elections, it was wagered that he would be ensconced in power for the next 20 years. The Congress, in power for ten years prior to the advent of Modi, was led by an aging and ailing Sonia Gandhi, a meek and colorless Manmohan Singh, and a greenhorn, Rahul Gandhi. The party looked jaded, seemingly unequal to the task of fulfilling the aspirations of a restless Indian middle class and an increasingly youthful Indian population with a median age of 28. The BJP/NDA led by Narendra Modi, on the other hand, was glittering. Modi appeared to be a knight in shining armor who would pull Indians out of the rut they were in; a breath of fresh air; an inspiring leader with a track record of being a no-nonsense administrator as Chief Minister of Gujarat, the home state of many of India’s successful entrepreneurs. Modi embodied the idea of the “new Indian” rising from a humble beginning to the pinnacle of success. The BJP trumpeted his claim to have been a tea seller in a railway station, who battled adversity and deprivation to reach the top of the political hierarchy in Gujarat. Disgruntled and jobless Indian youth dreamt of being a Modi themselves. In contrast, Congress leader Rahul Gandhi was no model for growth. He was born with a silver spoon in his mouth and didn’t have to struggle at all. Giving the burgeoning proportion of unemployed and under-employed youth in the Indian population, Modi promised 20 million new jobs every year. He promised to give a turbo-boost to industrialization by touting his “Make in India” scheme. No wonder, 34% of voters aged between 18 and 25 voted for the BJP in 2014. Only 19% voted Congress. Modi promised the middle and the poorer classes that he would seize black money stashed away by the rich abroad and put Rs.15 lakh (US$ 21,000) of it into every Indian’s bank account. Given his anti-Muslim past, vast sections of India’s Hindu majority expected Modi to take a no-nonsense stand against Islamic Pakistan and put down assertive Islam in India with an iron fist as he did in Gujarat in 2002 by allowing Hindu mobs to go on a killing spree. To further consolidate his hold on radical Hindus, Modi promised to build a temple for Lord Rama at his birthplace in Ayodhya, over which a mosque had stood before it was demolished by Hindu mobs in 1992. Modi deliberately avoided the Muslim minority in his election campaign to endear himself to the Hindu majority. The result- Hindu consolidation occurred like never before. While Modi was flamboyant on the public platform and oozed confidence bordering on arrogance in personal interactions, Congress party’s new leader Rahul Gandhi looked the anti-thesis. His public speeches were pedestrian and he seemed to revel in understating his case. Quick to react, social media trolled him, nicknaming him “Pappu” (Hindi for a useless, unintelligent young man) and a “faku” (a fake). The “Modi wave” which swept the BJP-led NDA to power in May 2014, continued through the year. The party won State Assembly elections in Maharashtra, Haryana, Jharkhand and almost made it in Jammu and Kashmir. But come 2015, the wave began to recede. The BJP was routed in Delhi. It lost Bihar. However, 2016 saw recovery with a significant success in Assam mainly due to Hindu consolidation against Muslims. In 2017, results were mixed. The BJP won handsomely in Uttar Pradesh (UP) and Uttarakhand, but lost in Punjab and Manipur. It was touch and go in Goa and Gujarat though the BJP made it finally. The Congress’ comeback in Gujarat showed that Modi was no longer an unmatched hero even in his own home turf. Gujarat sent a warning signal, but overconfident Modi paid no heed to it. 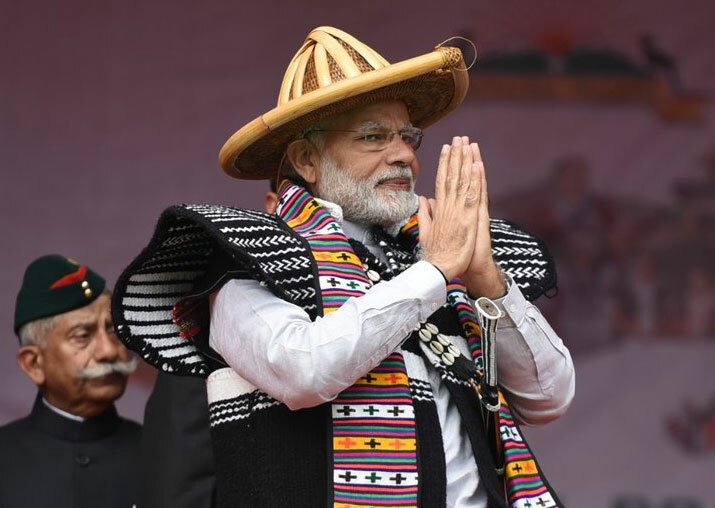 In 2018, the BJP won Tripura and managed to form governments in Meghalaya and Nagaland by sewing up post- election alliances. But it lost strongholds like Madhya Pradesh and Rajasthan and Chattisgarh and failed to form a government in Karnataka. In the by-elections held in some of the key North Indian States, the BJP got a drubbing. Significantly, it lost two parliamentary constituencies in UP, namely Gorakhpur and Phulpur, the former held by State Chief Minister Yogi Adityanath and the latter by his Deputy, Keshav Prasad Maurya. The lesson in all this was that if the opposition combined, the BJP could be defeated. In a sense, the Modi wave was a product of opposition disunity. Buoyed by successes in 2017 and 2018, the Congress has now inducted Rahul Gandhi’s elder sister and Indira Gandhi lookalike, Priyanka Gandhi, as the General Secretary of the party for Eastern Uttar Pradesh. UP, as a whole, has over 80 seats in parliament and Varanasi in Eastern UP is Modi’s parliamentary constituency. The idea in inducting Priyanka was to oust Modi from his pocket borough, the holy city of Varanasi. The reasons for Modi’s decline are not far to seek. The Indian Prime Minister had got his prioritization wrong. Instead of being an organizer of men, he was on an egotistic trip, projecting himself as a superman changing India with a magic wand. He spent more time on foreign travels than on attending to mundane work at home. He went about hugging foreign leaders for the visual effect rather than for getting meaningful investments for his “Make in India” program. Under Modi, FDI did groew to US$ 60 billion in 2017, but FDI in industries was too small. The number of FDI companies on March 31, 2016, stood at 6,433, but 4,070 of these were in the services sector and only 1820 in manufacturing. Modi promised 20 million jobs for the youth every year through his ‘Make in India’ program but during the first four years of his regime, unemployment went up. Economic activity slowed down and jobs were lost due to measures like the de-monetization of Rs. 500 and Rs.1000 notes. The All-India General Sales Tax (GST) which he introduced was too cumbersome to comply with. According to the IndiaSpend website, mining and quarrying, textiles and manufacturing, saw falling employment growth rates between 2014-15 and 2015-16. Agriculture growth rates fell from minus 1.9% in 2011-12 to minus 3.6% in 2015-16. Modi’s bid to unearth black money through the de-monetization of 80% of the currency in circulation, and put Rs.15 lakh (US$ 21,000) into every Indian’s bank account, caused more harm than good. No black money was unearthed but individuals, trade and industry suffered hardship. The informal economy and agriculture, which functioned with cash, were hard hit. A decline in growth and employment followed. The Modi regime is now indelibly identified with crony capitalism. Modi’s friend Nirav Modi fled the country after looting the State-owned Punjab National Bank of Rs 11,000 crore (US$ 1.8 million). Another absconder crony is Vijay Malya of the UB Group, who owes banks Rs.9000 crore (US$ 1.2 billion). The Prime Minister’s friend Anil Ambani has been given a huge contract to build some spare parts for the French fighter Rafale when his firm has no experience in the aeronautics sector. The claims of the experienced State-sector Hindustan Aeronautics to the contract were brushed aside. With falling political fortunes, the BJP is on the defensive. To make up for non-performance in the last four and a half years, the Modi government is currently indulging in populism through the annual budget. To fund the envisaged largesse, it invoked Sec. 7 of the Reserve Bank of India Act to get access to the Central bank’s reserve funds. The crisis has created rifts within the BJP’s ranks. The Union Minister for Water Resources, Shipping and Transport, Nitin Gadkari, has been taking potshots at Modi saying that leaders should not make promises they cannot fulfill and that people would beat them up if they do not make the dreams they instill, come true. The Rashtriya Swayamsewak Sangh (RSS), which is the parent body of the BJP, is reportedly unhappy with Modi for his lack of concern for the economic plight of the hoi polloi, without whose support the BJP cannot remain in power.